Oh my goodness! Okay, I even took it this time and its working...I think. LOL. Let me know if there are any other problems. Thank you, thank you for letting me know! I fixed it! This is a in progress Master's Capstone titled "Registered Nurses' Perceptions on Barriers to Reporting Wrongdoing." This study has received approval through Allnurses.com Please see Informed Consent below with survey link at the end of the page. INFORMED CONSENT FORM Western Governors University Master of Science, Nursing-Leadership and Management Perceptions on Barriers to Reporting Wrongdoing Ashleigh Gonzalez Introduction You are invited to participate in a research project being conducted by a graduate nursing student from Western Governors University. Ashleigh Gonzalez, RN is conducting research to examine the most prevalent barriers of reporting wrongdoing amongst registered nurses (RNs). Description of the project: This project seeks to understand the barriers to reporting wrongdoing identified by RNs. By gaining insight amongst the barriers, interventions and changes can be implemented to alleviate the challenges. By alleviating the impediments, reporting wrongdoing may become more accepted by RNs. Accountability by RNs and healthcare organizations gaining knowledge of wrongdoing will help to facilitate improving patient safety and quality care. Partaking in this research study entails completing a brief anonymous electronic survey. Benefits and Risks of this study: The potential benefits from this study include the identification of barriers to reporting wrongdoing which may include the influence of personal feelings, actions, reactions and impacts caused by culture or healthcare organizations. The identification of these barriers can ultimately be corrected, thus improving patient safety and quality care. There will be no direct benefit from participation. Participation is completely voluntary and anonymous. There is no identified risk to the participant. Confidentiality: Anonymity will be maintained throughout this entire study. There is absolutely no identified information during this study. Survey answers are not connected or associated with any participant. Voluntary participation and withdrawal: In this study, participation is entirely voluntary. Participants may opt to complete questions based on their desecration. Participants may withdraw from the survey at any point and will not be penalized for non-participation of every question. Once the survey is submitted, surveys cannot be retracted. Questions, Rights and Complaints: Any questions, comments or complaints can be referred to Ashleigh Gonzalez, RN. Upon completion of the study, all participants will have the right to review the results. Consent Statement: By clicking past this page, you are consenting to participate in this study. 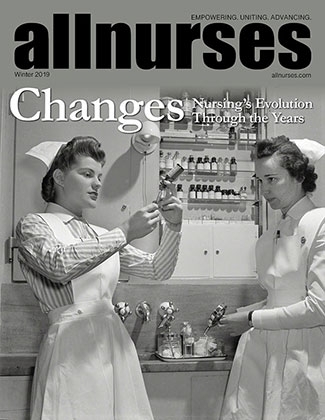 The final Capstone will be published as an article on the website of www.Allnurses.com. Survey Link: http://www.surveymonkey.com/s/97LVZGF Thank you in advance!